Seven days ago we left Istanbul bound for Warsaw, Poland. Istanbul is an amazing blend of the East and the West – the exotic and the ordinary. Mustached men and shrouded women mix with hip youth in western garb. Minarets of mosques stand against a clear blue sky and the sounds of prayer drift through the air and mix with the squawk of the seagulls. Turkish delights and baklava satisfy a craving for sweets and anything else you’d ever need is found on one of the sixty-five covered streets in the Grand Bazaar. One day was far too little time to spend in such a fascinating city but we will return for one day more after visiting Warsaw and Moscow. 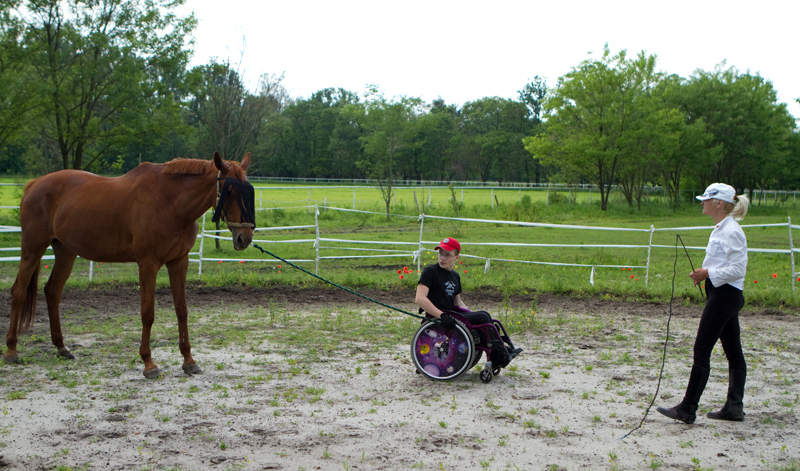 Our subject in Warsaw is Viola Majewska, who works with disabled children, using hippo therapy. Hippo therapy uses horses to aid with physical and psychological problems. It improves balance and coordination and helps in building trust in relationships. I heard about Viola from Anna (Liszewska) and her husband Aaron Ansarov, friends and colleagues from the United States – Anna is originally from Poland. The last couple of days have been remarkable, watching Viola and her colleague, Marta work side by side with children who have various disabilities from epilepsy to flacid muscles to social problems. It was clear from the start that Viola has a gift and I watched as the children trusted in her and responded. She is firm yet encouraging with every little triumph the children make. Viola’s story in how she began her hippo therapy clinic is a sad one. After two failed pregnancies, Viola had a daughter who had cystic fibrosis. Her daughter died when she was just 13 years old and Viola left her job and started this foundation to help other children. When she came to the stables, it was in shambles and with her own two hands fixed fences, mended roofs and did what she needed to do to make it suitable. Viola gives lessons to other children and adults and this is how she gets by but she is hoping to build the foundation and staff to be able to help more children with needs. Right now she has 9 horses – many who she saved from the slaughterhouse. I spoke with one man whose daughter takes lessons with Viola and he told me that it is simply amazing what Viola has accomplished with her clinic in such a short time and that his daughter is thriving under her guidance. I have watched Viola work tirelessly for the last few days and I don’t know where she gets her energy but it is sheer will, determination and the passion to help make a difference. We have been communicating with Viola through Marta Walkowska, who works with her because Viola doesn’t speak English. But beyond the language barrier, I can feel Viola’s spirit and her true heart and she has certainly captured a part of mine. This entry was posted in People Making a Difference, Philanthropy, Photography, Travel, Video and tagged around the world, documentary, extraordinary people, helping others, inspiration, passion, People Making a Difference, Travel, volunteers. Bookmark the permalink. What an incredible program that Viola Majewska is running, and how wonderful you found this story by simply reaching out, letting different leads lead you to the right stories. It’s funny, but as much as I have followed your project, it’s only now, thinking about Majewska’s story, the story you captured in Uganda, and the many stories you still have yet to capture. . .Well, I’m starting to see just how amazing this documentary will be.